This is the culmination of my last 4 years of learning Game Maker Studio and I think it turned out okay, it's just a single level for all 6 I guess you'd call them sections of the game, but I'm on my way to getting the full game done! Works with X box 360 controller, and keyboard controls can be customized in game. Okay so a very addictive game to be sure, I must've played for like an hour and only got to the second area before getting hit by everything got too frustrating for me :P the hitting projectiles back feels really nice to do. I think making things move a bit faster would be good, and the land mines need a better way to telegraph where they are I kept taking damage from those with no time to react. certain enemy placements are really hard to get past without the shuriken and I didn't always get them on every run. But all in all a solid experience. Hello itch community! Still in the process of making fully realized levels for this but this demo does come with 1 sample level you can try to complete after getting past the quick learn the controls tutorial area. Only takes like a minute once you get used to it. I'm open eared to any and all constructive feedback so I hope you'll give the game a whirl, It's my first big one and I'm anxious to see it completed! Fun concept, I like the idea of using the pits to loop around to the top of the level and reach other areas. I couldn't really clear level 5 though, all the enemies were dead. I assumed you had to kill the blocks that fall too but I couldn't jump on or bomb them. itch.io Community » General » General Discussion · Replied to CannibalInteractive in Introduce yourself! I'll think about it. But hey thanks man ths was helpful. Yeah changing equipment and exploring the world to find it or get it from side quests would be ideal I think. Then there's no grinding involved so that's a good idea. But it makes me wonder then why have monsters in the first place? They'd have to serve some kind of purpose other than just be in your way. Maybe just give them item drops and cash for killing them that can be used for upgrading equipment ? itch.io Community » General » General Discussion · Replied to null in Introduce yourself! Well Thank you and I definitely will ! That's good advice. I did have an idea in mind for a battle mechanic, but I wanted a way to cut out the need to grind exp and still keep enemies engaging and fun to fight. That's where I ran into a block. Hello all, as you can probably tell by looking you can call me Keero. I've just started working with Game Maker Studio, well, I say just, it has been around 3 or so years and I know that seems like a long time to not already have a game completed but what can I say slow learner? I did almost complete a platformer game as my first ever project but at the last stretch it turns out there were too many technical complications and it didn't feel right in the end so I dumped that but kept the experience and tried again! This time succeeding with my new idea for a Bullet Hell / Puzzle platformer. 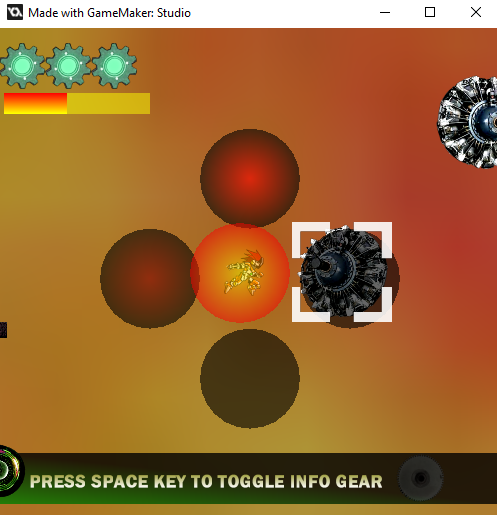 Titled Giga Gear. It's in the final phase of development now and I have a small sample demo to play so It'd be great to get some feedback on it, and I hope my time in the itch.io community is well spent! wow a 30 hour rpg in only 2 years. That's impressive! I always wanted to try an rpg after I made my very first game but it just seemed like too much for me. Sure I'll add some now actually. and thank you for the interest !